Mark became a Board member in 2017, and has been a co-chair of the running leg of the Ski to Sea Race since the 2016. Mark has also participated in the Ski to Sea race on numerous occasions, alternating over the years between the downhill ski, run and mountain bike legs. By day, Mark is a local attorney with the firm Brownlie, Wolf & Lee, LLP. In his free time, Mark can typically be found on his skis at Mount Baker Ski Area, or on a road or mountain bike. Being on the Board of Whatcom Events provides Mark with the unique opportunity to preserve, grow and foster what he considers to be the single most important community event in Whatcom County. Mike joined the Board in 2011 and has served on the Race Committee and as the Executive Director ever since. Mike grew up in Bellingham and has been the Operations Manager of the Mount Baker Ski Area since the early 90’s. 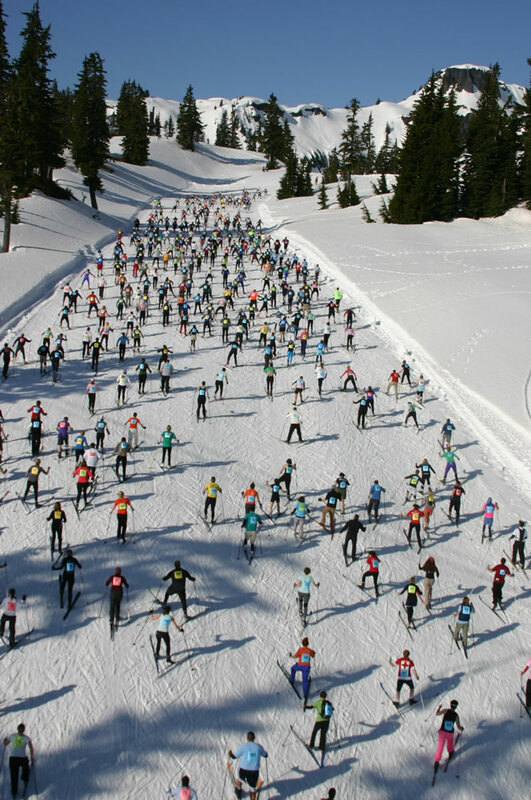 He has participated in Ski to Sea over a dozen time in numerous legs, often racing for the Mt Baker Ski Area team. In his off time he is skiing, biking (road and mountain), running and trying to keep up with his kids, literally, as the entire family participates in numerous athletic events each year. Tiffany joined the Board in 2017 and has been on the Ski to Sea Race Committee since 2014. Born and raised in Whatcom County, Tiffany graduated from Mt. Baker High School and then Western Washington University with a Bachelor’s degree in Political Science. After spending 15 years away from Whatcom County while her husband served in the United States Marine Corps, the family returned to enjoy all the Pacific Northwest has to offer. Three grown children and a full time position with the Port of Bellingham managing event spaces and planning community outreach events keeps Tiffany busy year round. In her off hours, she is an avid runner and skier and enjoys trips to the San Juan Islands in the summer. She is serving on the Whatcom Events Board to help foster a sense of community and outdoor recreation experiences we are lucky to have in the Upper left! Larry joined the Board in 2017 and has been on the Race Committee since 1990 working on the kayak leg of Ski to Sea. He has participated in the race 32 times (sailing, x-country, canoeing, and kayaking)! Larry grew up in NE Montana and earned a BS degree in Mechanical Engineering at Montana State University. He worked 43 years doing Project Management in heavy industry (mining, refining, and smelting), the last 37 years in Whatcom County, before retiring in 2015. He has two grown children, one granddaughter and a tolerant and loving wife of 46 years. Larry’s retirement activities include kayaking, power boating, and x-country skiing. Whatcom Events gives Larry a unique opportunity to support the community and promote his love of physical fitness at the same time. Terri joined the board in 2017 and has been on the Ski to Sea Race Committee since 2016 after having participated in the race several times. Terri is a graduate of WWU. She moved back to Bellingham with her husband to raise their two sons. Terri works for Mt. Baker Ski Area and not surprisingly loves to ski, as well as mountain bike, road bike and trail run. Outdoor recreation provide her with a sense of belonging and well-being which is important to her and her family. Whatcom Events gives her the chance to support and give back to the community. Tracy became a Board member in 2017 and has been co-chairing the Kayak Leg since 2015. She has been an active volunteer since 2013 with Ski to Sea, organizing the safety boats from United States Power Squadrons of Bellingham. Tracy works as a Nurse and office manager at Bellingham Medical Clinic, then after hours she runs her own business, Accent Embroidery and Sewing, custom embroidery and sewing. Tracy puts in time with Dog training classes and trains her own German shepherd Dog for AKC shows. Being on the Board of Whatcom Events is an opportunity to support the community with amazing outdoor recreational adventures in the Pacific Northwest.